Develop a tactically sound plan before the unexpected happens. Our homes provide us and our families with security that we otherwise would not have. But even the best home security measures are not effective 100% of the time. 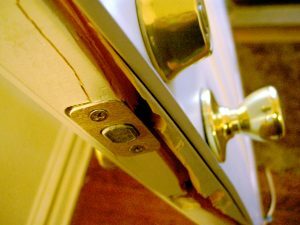 What happens when that security is broken and someone gains entry into our home? How you respond is arguably more important than what weapon you respond with. For the vast majority, the only handgun training is done on the range. And that may or may not include tactics. And if it does include tactics, it likely is not focused on defending the home. 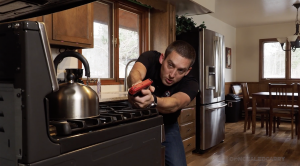 If you are forward thinking enough to have taken a home defense class, have you actually applied those tactics in your own home? With your own furniture, your own family members, and with all the blind corners, open areas, hiding spots and fatal funnels? Only you know the answer. If you have been training inside your home, kudos. If not, you should. Why? Because home burglaries happen a lot. 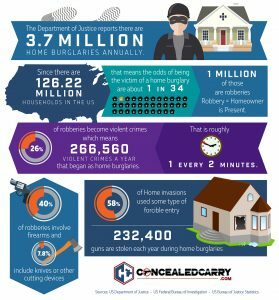 According to the DOJ, on average from 2003-2007, there were 3,700,000.00 (or 3.7 million) burglaries each year. Of those, a whopping 1 million occurred when someone was home. And, of those, 256,560 burglaries turned violent. So you have a greater than 1 in 4 chance of having a family member home when someone breaks in. Here is the thing, it may not be you who is home when it happens. Are your loved ones also equipped mentally and physically to defend against an intruder? These statistics from the DOJ may surprise you. The simple answer is don't. Before you fly off the handle about me recommending you do nothing when you hear a noise in the night let me give you some context. Do we call the police every time we hear a noise inside our home? Of course not. But we all want to check and investigate that noise we just heard. What we typically discover is something innocuous, like a picture that fell, or a pet that knocked something over, right? We are relatively certain that these noises are not an intruder and we don't immediately call police. We absolutely should respond to these noises prudently and tactically. But maybe we have heard that noise before, or know exactly what it is. In any event, something inside us tells us we know what the cause of this noise is, and that dictates our response. Defending the home from a tactically sound location is preferable. Now suppose you hear breaking glass, followed by more sounds. This may indicate someone is trying to or actually has gained access into your home. Your response should absolutely be different than the above scenario. Maybe it's a situation like this story, where the neighbor wants you to check out their home because they think someone may be inside. Or how about this story we recently covered on the podcast, where the subject hears screaming and pounding on the door of their attached garage and goes to investigate. If your first course of action is to locate and engage the intruder, you may want to rethink your response plan. And probably the obvious reason not to search out the bad guy, is that you drastically decrease the probability of being involved in a deadly force encounter. The best way to avoid getting shot is to avoid being in a shootout. Don't search for trouble, because often times you will find it, and it may not be what you expected. For these reasons it just makes no sense to search the house or a garage for a bad guy. 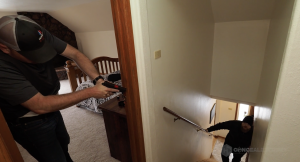 Learn from the guy who had a maniac enter his home with an AR, then shoot and kill his roommate. He retreated to an upstairs bathroom with his firearm and was able to kill the attacker with a handgun. Clearing a house alone exposes you to unnecessary risks. There are simply too many places someone could ambush you from. Similarly, if you arrive to a home that should be empty and either know someone is inside or there is an indication that someone gained entry, you should not go searching your home to locate the bad guy/s. Get to a safe location, observe the home and call police. Scan for things that are out of place: strange or occupied vehicles, lookouts, broken windows or removed window screens etc. Give police as much information as possible as to who should be home, pets, or possible areas the subjects may run to if they see police arriving. Also, think about any unsecured firearms that the burglars may now be in possession of. These actions will go much further in the possibility of catching the criminals, than searching the house on your own. And, once again you place yourself in a near zero percent chance of being involved in a deadly force incident. Okay What Should You Do Instead? 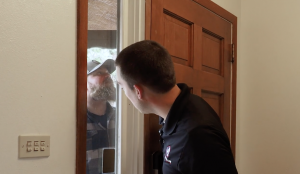 The basic premise in a situation where you are home and believe someone is attempting to, or has gained entry to your home, is to isolate your family in one part of the home, call police and defend that area. Hopefully your family has thought about this beforehand and knows where to go. Your plan can be as simple as having one ‘safe room' or secondary and tertiary locations based on the complexity of your home's layout. Just like a fire escape plan that your family likely has, there should be a response based off of some best practices. The latest Complete Home Defense Course that we put together is thorough and is something that will benefit your entire family. It may seem like a shameless plug for the DVD, but it is a product that covers how your family should respond to an incident like this. Security of your home is everyone's responsibility. Similarly, they should know the family's response plan. We can't plan for every possible situation that comes our way. But what we can do is try and eliminate variables that make it more difficult to defend ourselves. We can also give ourselves a tactical advantage by staging firearms in strategic locations, and setting up rally points in our home that are easily defendable. You will always survive the gunfight you never get into. Don't let the bad guy dictate what will happen. Stack the deck and defend your family from a place with a tactical advantage. Here is our Home Defense Course, again, in case you wanted to check it out. It's worth every penny of the $39.45 price tag. 9 Responses to Should You Search Your House For The Bad Guy? Very humbled and appreciative of the kind words. Thank you! I like the info you share,but I am a Christian school teacher and can’t afford to buy the awesome info you guys organize, so I read what I can find,including active shooter info.We ARE a USMC family group.Semper Fi and keep up your important work. SO true. When I was young I made the mistake of leaving my family to look for the bad guy. Lucky for me it was nothing either time. But I did learn from my mistakes. I installed hidden traps in my yard to set off early alarms and they have worked several times. Thanks for the reminder because we do get comfortable. Good article. Should such a similar situation happen at my home I have a few early warning things to help out. HOME DEFENSE is just that, the bad individual is encroaching onto MY turf, he is the aggressor. IF the intruder gets past my second line of security my neighborhood will probably be awake and if the police have NOT arrived I and my wife have over 20 rounds avail in each pistol. My first personal defense weapon “TASER” no worry of thru shots and you can use it at will. Less blood too. Great article! Same for armed civilians and active shooter events. Find, set up, and defend a small, tactically sound place. I’m too old to “go hunting” like I used to be able! I carry 24/7. I will shoot to kill if approached by a criminal. I here alot.of feral cats and wind whipping around. Occasionally I walk thru and look out side with a .45 acp or 9 mm. Or 357. Carbine. A lot of things that go on no was days in in Broad day lite at around 2 to 4 PM. When school let’s out.